We took sometime and slept in this morning – what a gamechanger! The weather so beautiful it Budapest, and we spent in walking around and soaking in the city. For the second time, I went on a free walking tour in Budapest, and for the second time it was amazing. The tour leaves from Vörösmarty square which is lovely. Last time I was here it was decorated with an Easter market, and this time around it was a spring market. There was food that smelled amazing, and so many cute little treats and trinkets. I was a little sad that we couldn’t spend more time before the tour got started. I learned even more about the city and Hungary as a whole on the tour the second time. Last time we went it was so windy and cold! I didn’t take as many pictures because of it, but believe me, I made up for this time. The tour starts in Pest and ends up in Buda. I should say, on Buda Hill. This means that we had to climb some pretty steep steps to make it up the hill, but the view was so worth it! After the tour we went and explored the first of two old churches that we’d see today. The first one was Matthias Church, a late-Gothic Catholic Church. The roof top was these amazing yellow, green, and red tiles. The inside was a little dark and heavy but it was a beautiful nonetheless. Next we had lunch inside Fishermans Bastion. Fishermans Bastion is this amazing terrace that was opened in 1902 that has this stunning views across the Danube river into Pest. It looks like a castle. They have especially amazing views of the Hungarian Parliament building. The sun was shining and it was the perfect time to soak in the weather and the view. For lunch I had a caesar salad and a delicious elderflower lemonade. Oh, so good! We took the bus back across the Chain Bridge to go explore St. Stephens Basilica . This was simply stunning. Just the dome alone! There was this beautiful choir singing that made it feel like you were sitting right in the presence of God. They sounded like angels. We went to the top of the basilica and were treated to even more amazing views of Budapest. I’m so struck once again by what a beautiful city it is. It’s such an interesting mix of beautiful romantic style architecture from the Hapsburgs, and the Soviet Union to occupied the city after World War II. I love how much charm and character the city has. There are so many squares and green spaces where the Budapesti were enjoying the weather. We came across this lovely beer garden that was so colorful and full of life. After that we went to the grocery store where I picked up some delicious Hungarian wine. The super sweet, but delicious Tokaji white wine, and the strong and spicy red called Bull’s Blood. I stopped by this market to get the most tasty chicken burger I’ve ever had in my life. For dinner we went back to one of my favorites in the Jewish Quarter – Koleves. This time we sat in the outdoor garden which has so much personality. I tried the goulash! So flavorful. Then we went to the most popular of the ruinpubs, Szimpla Kert. It’s such a funky looking place, but the vibe there is so cool. UP NEXT: The morning will be spent at the baths! Then we’ll say goodbye to Hungary and be on our way to our next stop – Denmark! After months of planning it was finally time to pack my bags and hit the road! I can admit to you guys that I came into this vacation much more stressed than I usually am. I was so ready to take a break and go explore! This year we’re going to three countries I’ve been to before: Hungary, France, and the United Kingdom, and I’m visiting a new one – Denmark! What a long day yesterday was! After putting in a half day of work, I hauled it home to gather my things and head to the airport. For once I didn’t get to the airport late! In fact, I got there mad early, by no choice of my own, but that’s a whole other story. I decided to go and grab a drink, and start to decompress a little bit before boarding the plane. Soon my friend Kristin was with me, and we were sharing our excitement for this upcoming adventure. We boarded the plane with no issues and before I knew it we were landing into Heathrow! The view outside the window was dreary and I must say that I’m glad we weren’t heading into the city today. Instead we made our connection to Hungary! I was knocked out on that flight and opened my eyes to sunshine! It was a beautiful, and warm day in Budapest! 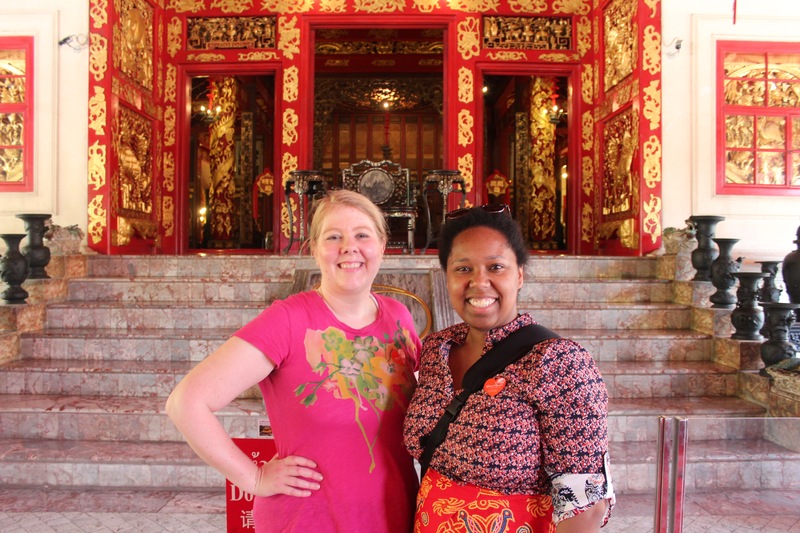 We hopped off the airplane ready to grab our baggage, get into the central part of the city and start exploring! Alas, that is not in fact, what we would do because we ran into a line of a few hundred people waiting to go through passport control. We stood in that line for over a long, exhausted, frustrating hour. There were five border control agents for ALL of the flights coming in. I could have gotten upset, but I just decided to relax, put my planned schedule aside, and just get through it. Soon enough we were in the car headed to our apartment. After taking some time to freshen up, we grabbed the trolley and rolled our way to the Central Market. This is the beautiful market that I went to last time, but my sole goal in going was to get some langos. It’s a Hungarian dish and it’s deep fried dough with whatever toppings you want. I just got cheese on cheese on cheese. YUM! After that meal, we needed to walk off the langos, so we walked across the Danube river to Buda and walked along the river. It’s about 70 degrees here and my body was not ready for that. It was lovely though, and the Hungarians were out enjoying the weather. Next we headed to the ruinpub Mazel Tov. It was such a fun atmosphere and the food was delicious. I knew it was going to be a good place when we hear Billie Holiday over the speakers. The drink menu looked amazing. Yes, I flew all the way to Hungary to have a drink with bourbon in it, but it was so, so good! Ruinpubs are basically old warehouse or building, likely from the USSR days, that they’ve turned into a kind of night club or restaurant. The ruinpubs that I went to last time were much more lounge-like than Mazel Tov, but I like the vibe a little bit more. Then we closed out the day by walking back to our flat, completely exhausted, but satisfied, and so ready to take on the following day. UP NEXT: Free walking tour and exploring Buda! As you may have noticed, I have been absent for nearly five months. Like much of the rest of the world there’s been a long going on. I’ll start with a brief introduction. In October of last year, I started the Secret Life of Daydreams (sounds familiar, eh?) Daydreams is a social events company in Washington, D.C., focused on hosting fun and interesting events in the area – starting with arts and crafts for adults. I was inspired by how much I love the quiet times of arts and crafts and being creative with friends. I thought perhaps there were other people who might be interested in that too, and so far it’s received a warm reception. I hosted my first Crafternoon in June, and it’s been rolling since this. It’s been an amazing time of understanding myself and what I’m capable of, especially when I’m only limited by own creativity or idea of what’s possible. It’s also been such a time of growth in my relationship with God. I’ve been really pressed in how much I truly trust Him. It’s scary, but so awesome. Over the last few months I’ve also hosted an amazing birthday brunch were I got to be surrounded by family and friends, and feed my desire to host in my new apartment. Though, I guess it’s not new anymore since I just re-signed my lease, but what can I say? This year is throwing everything off. I haven’t done too much travel, a few small trips here and there. I must say that I thought I’d miss it a lot more when I left USGBC, but I really don’t. I got my London and big trip fixes this year and I’m really okay with everything else. Kim came to visit! It was almost like when were back in college, tooling around Arlington and D.C. Now, however, we have a car and some money! I’ve spent time with old fellow USGBCers that I missed, and it was just recently a year since I left. It’s still a little weird to me. Greenbuild is next week and for the first time in ten years I have absolutely nothing to do with it. I’ve also experienced loss during this time, but I’m still getting to a place where I can write about it. When I can, I’ll share. If there’s something I love about Washington, D.C., especially in the summer, it’s that many of the historic mansions in the city take full advantage of the high nerd level in the city and host a variety of interesting events. I’m going to be exploring many of those this summer and sharing them with you. Earlier this week I tried something new: Vintage Game Night at the Woodrow Wilson House. I’m not sure what I was expecting but it certainly wasn’t scores of young professionals leaning elegantly against their croquet mallets, and playing card games circa the early 1900s with strangers while sipping white wine. The entrance fee of $15 includes two drink tickets, light snacks, several games with instructions, but most awesomely for me, the historic venue to lounge around as if you were personally invited by President and Mrs. Wilson themselves. I didn’t sense any of the pretension that I often find at events in D.C. There was none of that “where do YOU work?” business, which was beyond refreshing. Some of the games were super confusing and made me think that back in the day people didn’t have television, Twitter or blogs, so that had more mind space to make sense of the instructions. However, as we were leaving a group of people pulled us into this game of Pit which was so much fun. It’s a trading game where you yell at everyone trying to trade your cards until you have a fully matching set. It was a great way to make new friends. While we’d been getting ready to leave about twenty minutes early, we ended up staying twenty minutes after closing time. Want to experience Vintage Game Night yourself? It’s hosted every first Wednesday from 5:30pm-8:00pm. I didn’t take the time to write about day nine because it was basically just a travel day and involved a 30 hour journey back home. 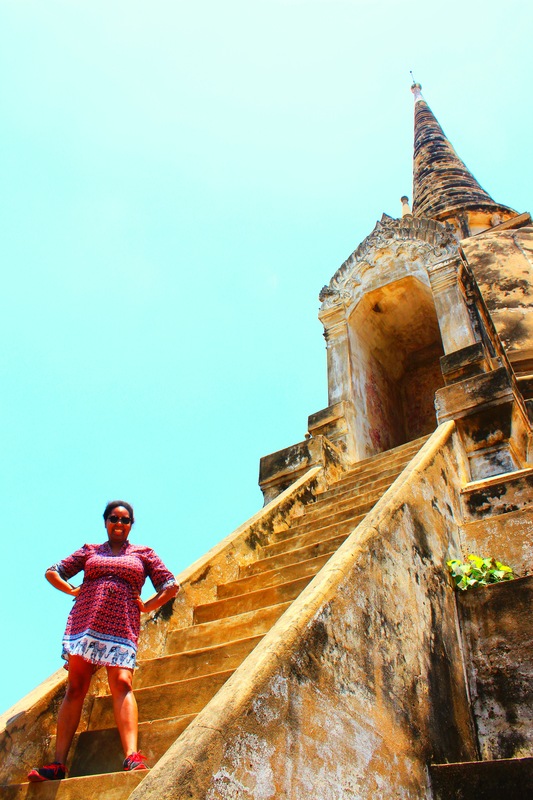 I was pretty sad to say goodbye to Koh Samui! What a wonderful and peaceful place, I will definitely be back! I’ve been asked a few times what surprised me the most about my first foray into Asia. I guess I would say how foreign it didn’t seem to me. Maybe after all of these adventures I’ve just gotten used to being on the road. Or, it could have to do with the fact that there were a lot of other brown people walking around so I didn’t stand out quite as much as I do in other parts of the world. I didn’t expect to feel as comfortable as I did in a country where I had very little understanding of the language, was the farthest away from home that I’ve ever been, and one where 97% of the country was something other than Christian. Everything in Thailand is pretty relaxed, with a few unsettling exceptions like the number of cops walking around with serious artillery. Even in the mad rush and insanity of the city traffic, people were taking time to be polite in a way that I rarely see in Washington since we’re all rushing around all the time. There acceptance about the fact that we were all stuck in traffic as opposed to the anxiety and frustration that exists here. I felt like I could appreciate the not-so-dull roar around the city without being overwhelmed by it. I will absolutely be going back to Thailand. I want to go up to Chang Mai, which is in the northern part of the country, and I guess I should see what all the noise is about in Phuket as well. Though that party scene isn’t really my jam. I’m not quite sure yet. I can admit that I was looking up flights to South Africa on while on my layover in Doha. Perhaps there or somewhere in South America. Now that I’ve broken out of Europe the world is my oyster. Let me know if you have ideas. Wanna read the adventures from the beginning? ﻿It’s our last full day in Thailand! This turned out to be my favorite day, and we were planning to spend it on the water. 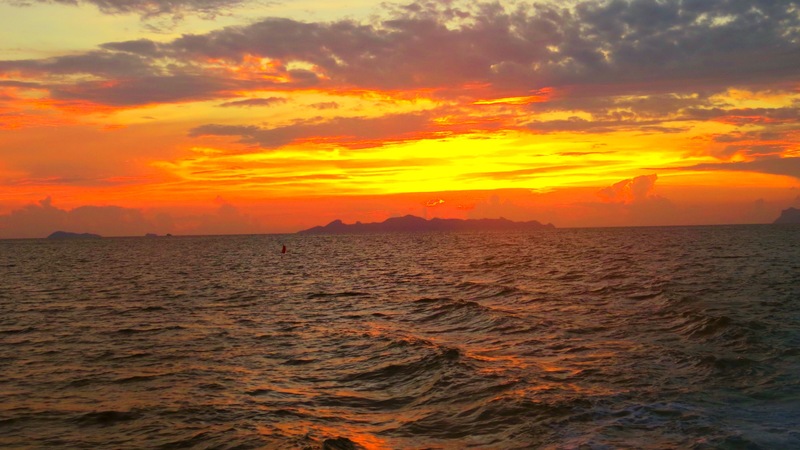 I found a tour that would take us on a traditional Thai yacht to Ang Thong Marine Park. 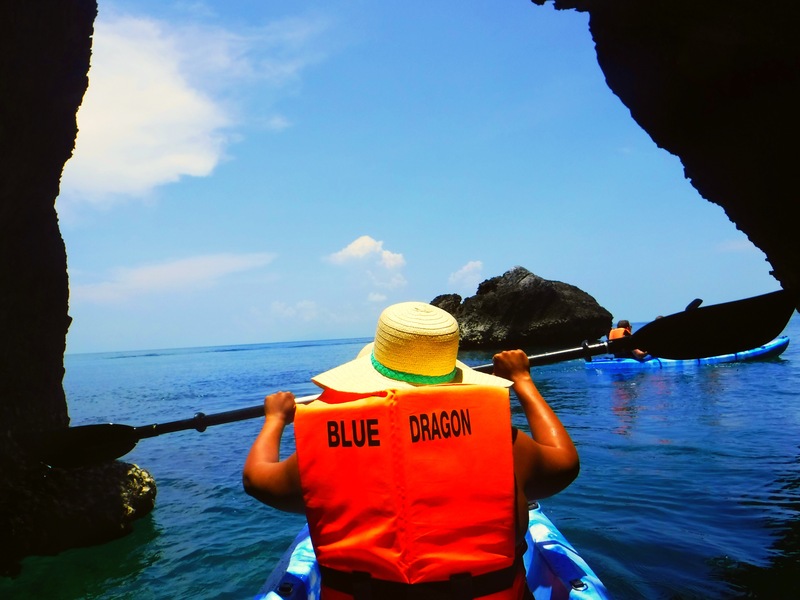 It would be a full day trip that would include snorkelng, kayaking, a Thai lunch, and a hike up to the Emerald Lagoon that was made popular by Leonard DiCaprio’s movie, The Beach. Before we knew it, we were off! There were so many incredible views that after awhile I just stopped taking pictures. Our first stop was to go kayaking. The guide took us under these islands and through the marine park. I wish we hadn’t been needing to kayak because I just wanted to float and take in the views. Next, we sailed a few to one of the other islands and went snorkeling. 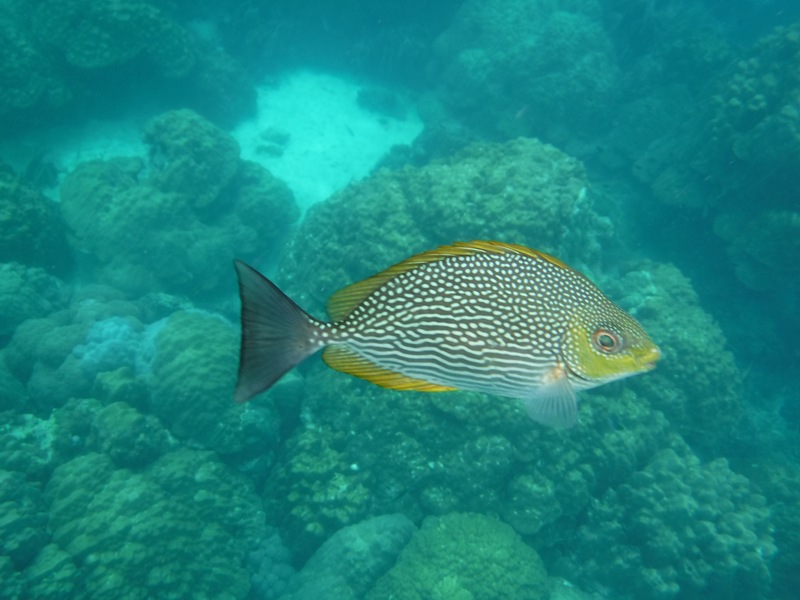 This was my first time snorkeling and I was so struck by this underwater world that existed. 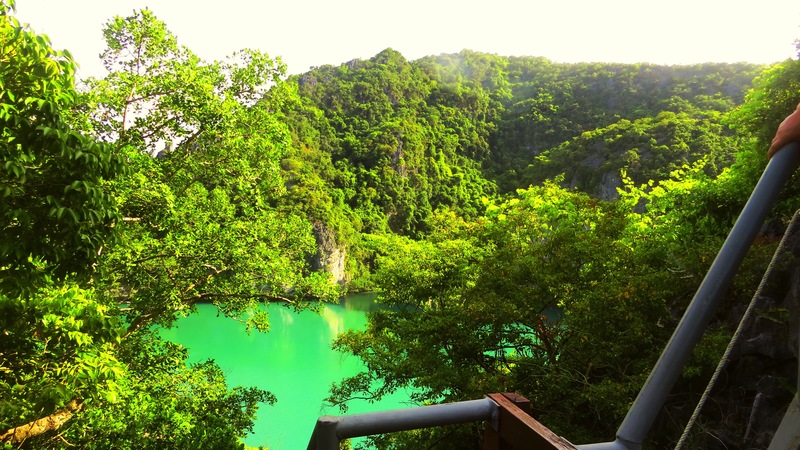 And lastly, we went to the Emerald Lagoon which is a hidden lagoon that you have to climb over 150 steps to get to. I will say that “steps” is a little misleading, it was more like climbing up a rock face on a very steep ladder. We did it though and the view at the top was well worth it. By now everyone on the boat was pretty exhausted. We all relaxed and enjoyed the ride back to Koh Samui. We were treated to an amazing sunset on the way back. Sitting on the bow of the ship watching the sunset I was struck by the incredible beauty of the place, and was so grateful to God that He’d brought me to that place to enjoy that moment. UP NEXT: A few hours at the market before the 30 hour journey home. Today was going to be relaxing. We were on an island town, we didn’t have much planned, and we were so excited for the day. What we planned for the day was a Thai cooking class. 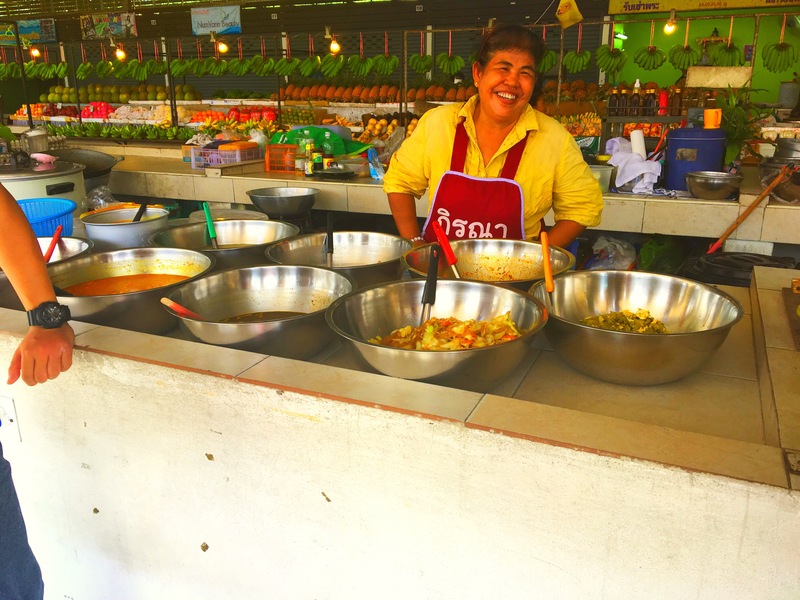 We met Stephanie, a French chef and ex-pat, at the Bophut Fresh Market. 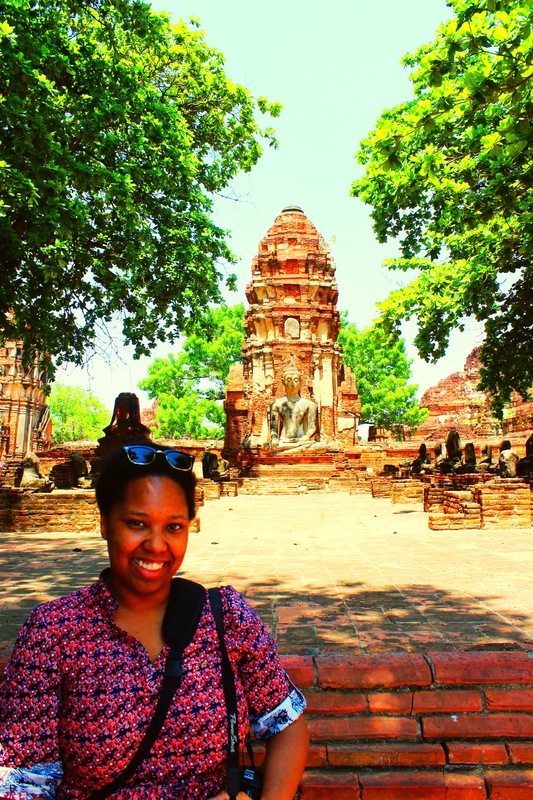 I must say that this was one of my favorite experiences in Thailand so far. 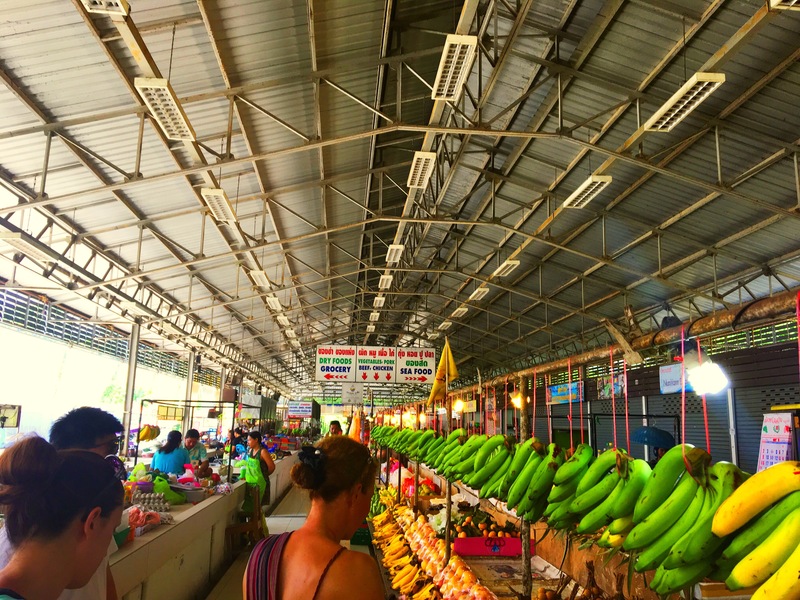 Stephanie went through nearly every fresh vegetable and item and explained to us what they were and how they are used in Thai cuisine. It was fascinating! Then she took us to this stall so that we could try some street food. In Thailand there is street food everywhere. Literally on the sidewalk someone will set up a grill sell food, and while it always smells good, we hadn’t been confident enough in the past that it wouldn’t make us sick! So when Stephanie could vouch for this chef and tell us that she prepares the food daily, and it’s always good, and we can trust it, I was in. I choose a spicy chicken dish and I don’t think I’ve ever tasted something so flavorful and delicious. I wanted to buy more but I knew that we were going to be making several dishes for lunch so I refrained. 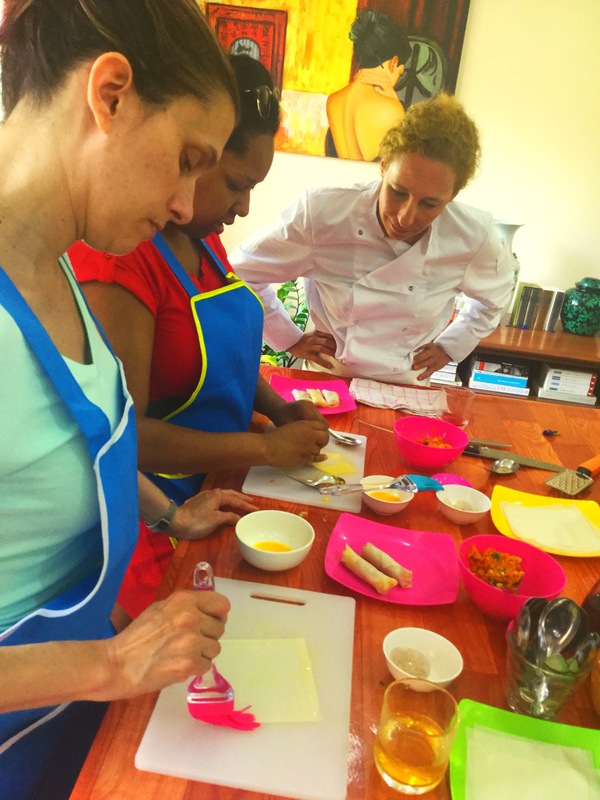 Stephanie took us back to the villa that served as her cooking school. We were greeted by three Thai ladies who would be helping us for the day. Since we got to choose items from the menu I went with stir fry ginger chicken, Thai spring rolls, and chili mixed vegetables. There was another guest from Australia who joined and chose two curry dishes. What we didn’t know was that he was also a chef which made sense because he made everything look so easy. The cooking was a lot of work but we had a wonderful time doing it and the meal afterwards was totally worth it. Next it was time to go to the spa. I got a sea salt scrub, a Thai massage, and a face mask. I don’t think I’ve ever been more relaxed in my life. I’d never had a Thai massage before and didn’t know what to expect. It was like a yoga class with hands-on assist the whole time. They gave me a Thai outfit (kind of like pajamas) and she pushed, and stretched, and pulled me until I was so very relaxed. Somehow, ﻿I managed to get my act together enough to slide out of the spa but let me tell you, it wasn’t easy! UP NEXT: Our last full day in Thailand! We’ll be going on a boat tour of the Ang Thong Marine Park. I can’t wait to see some unspoilt natural beauty! 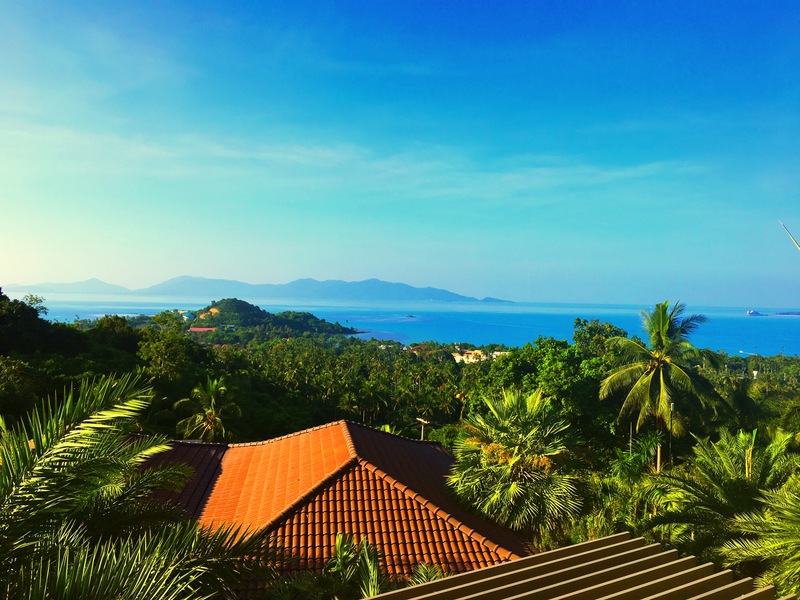 Today was mostly a travel day but by the end of we’d find ourselves in beautiful Koh Samui. We were craving some croissants, so we followed our noses to the Paul that was about two blocks away from the hotel. After eating a delicious breakfast, we made our way to the airport, excited to slow things down and cool off for a few days. There was a delay on the Tarmac in Bangkok, but before we knew it, we were cruising over the beautiful Gulf of Thailand. We landed at Koh Samui airport which is basically a whole bunch of connected huts. Our hotel sent a shuttle for us and we were greeted with cold towels, and iced bottled water. What a warm welcome! I guess we really shouldn’t have been surprised by this, but even though the temperature was a few degrees less than Bangkok, the humid was way higher. So much for getting away from the heat! The island was pretty interesting. Though the mopeds still ruled the road, they seemed a bit more polite here. Not everyone was rushing around. And why would you want to when you consider the amazing vistas there were around every corner? We weren’t staying on the beach but instead in the hills so that we could maximize our view. Watching the van navigate the crazy inclines on tiny roads was really taking me back to driving around in Scotland. Finally we arrived at the resort. The reception area was completely open air and before we knew it they were taking us up in a cart to our lovely room. For awhile we just soaked in this view. The hotel was offering an evening yoga class so I decided to take advantage. It ended up being a private class as I was the only one there! I had pretty much the same view as from my hotel room, and when I was on my back looking up, the sky was my ceiling! It was so lovely. For dinner we got sushi at a restaurant close by. It was a lovely and relaxing way to finish a day of travel! UP NEXT: A cooking class and the spa! 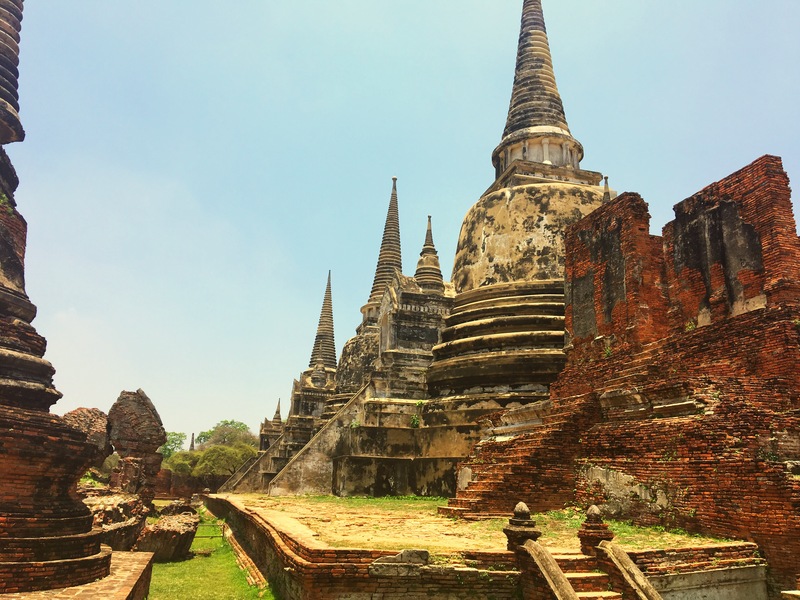 Today we’re leaving Bangkok to go explore the Summer Palace and some ancient ruins. It was an early morning, I can admit that. I’m still not completely on Bangkok time, but still it wasn’t painful to get up, but I wouldn’t have minded a few more minutes in bed either. A bus picked us up from our apartment to take us to where the coach would be leaving from. 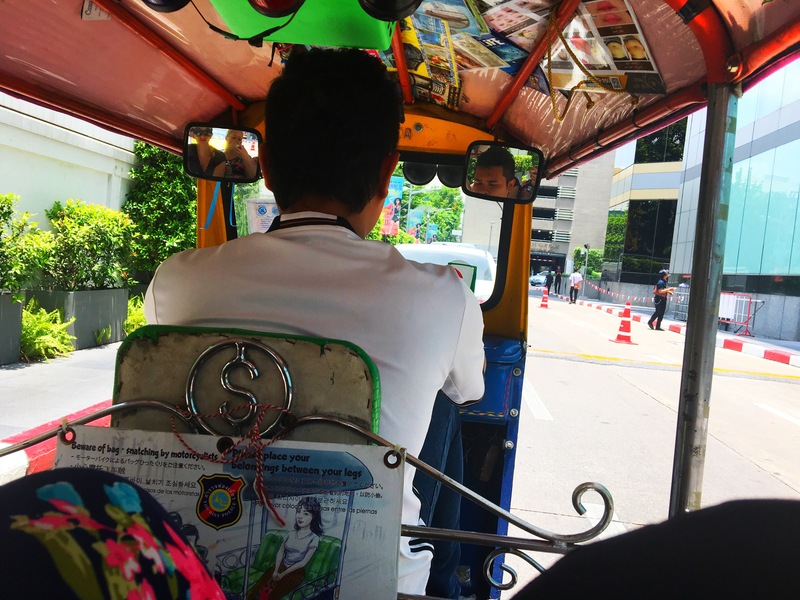 We got to drive through Bangkok’s Chinatown which I had wanted to do on our first day here but it just turned out to be too hot. Before long we were headed North of Bangkok, the traffic wasn’t too bad leaving the city but I felt bad for those trying to head into the city because it was bumper-to-bumper! 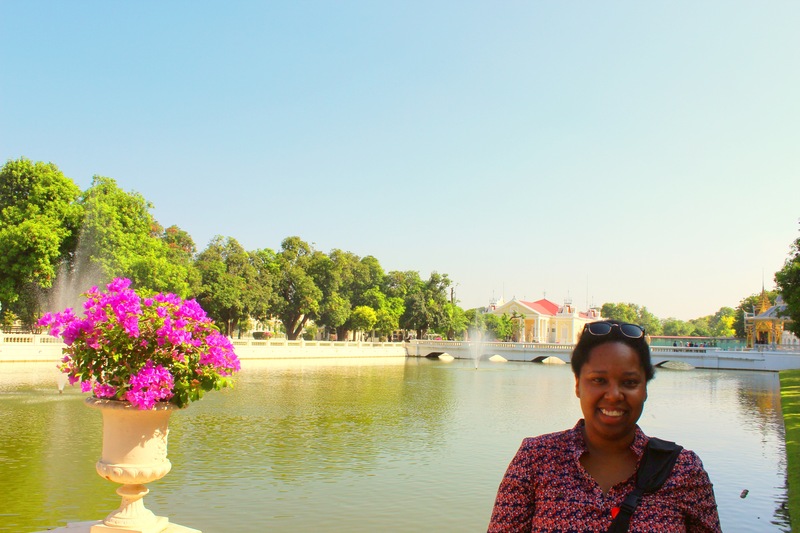 Our first stop was Bang Pa-In which was the Summer Palace for the Royal family originally constructed in 1632. Being here definitely took me back to exploring the summer palace in Vienna, but instead of one massive building, this was actually a complex of ornate buildings surrounded by peaceful park land and lakes. 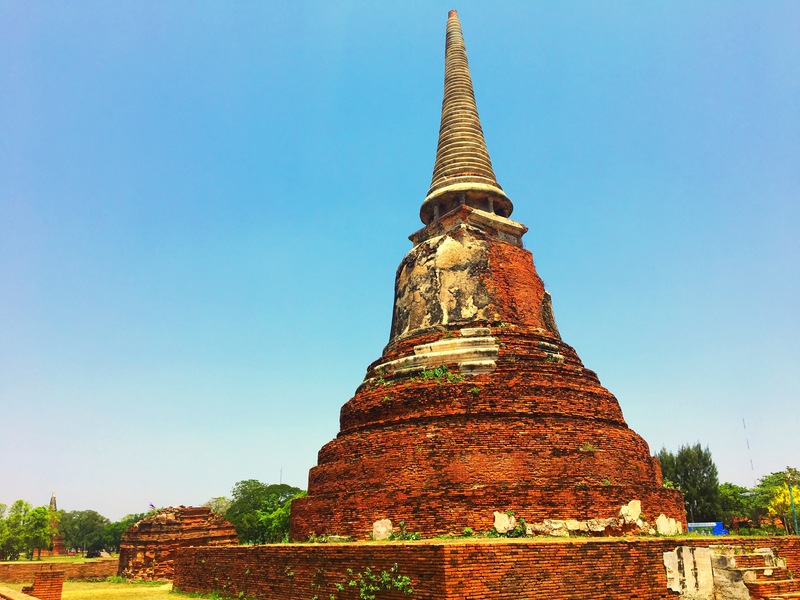 The next stop was the Ayutthaya Historical Park which was founded in 1632, but was pillaged by the Burmese in 1767. The grounds of this park were so extensive that we didn’t even get a chance to explore everything before it was time to go. It’s such a shame that these are basically ruins because I can image that it must have been an awe-inspiring place. 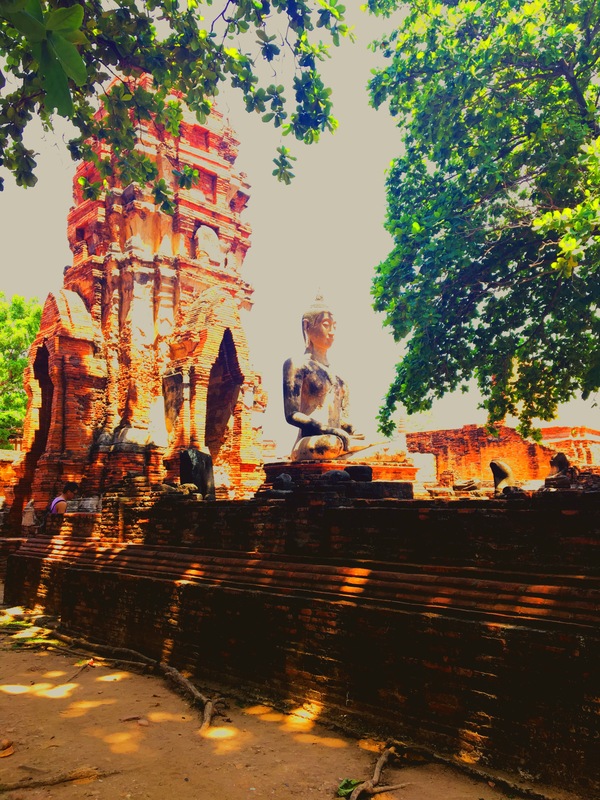 The last place we visited was Wat Phra Si Sanphet which was a very holy temple near the old capital. It was completed in 1351 and you could feel the Old was of the city. I felt like we were in an Indiana Jones movies exploring some archelogical dig. Instead of taking the bus back to Bangkok, we went to a boat and floated down the river back to the city. This was lovely because it was over 100 degrees and while extremely cool to be on these sites, it was also extremely, extremely hot. There was AC in the boat and they served a delicious Thai buffet for lunch. Thai food in D.C. is never going to be the same. After we got back to the apartment I was done in. I passed out in my room while the girls went to the pool. For dinner we decided to go fancy and went to dinner at this wine bar that was on the top floor of a hotel close by. I had a delicious tuna tare tare and finally a nice bourbon cocktail. Overall a steamy but wonderful day! 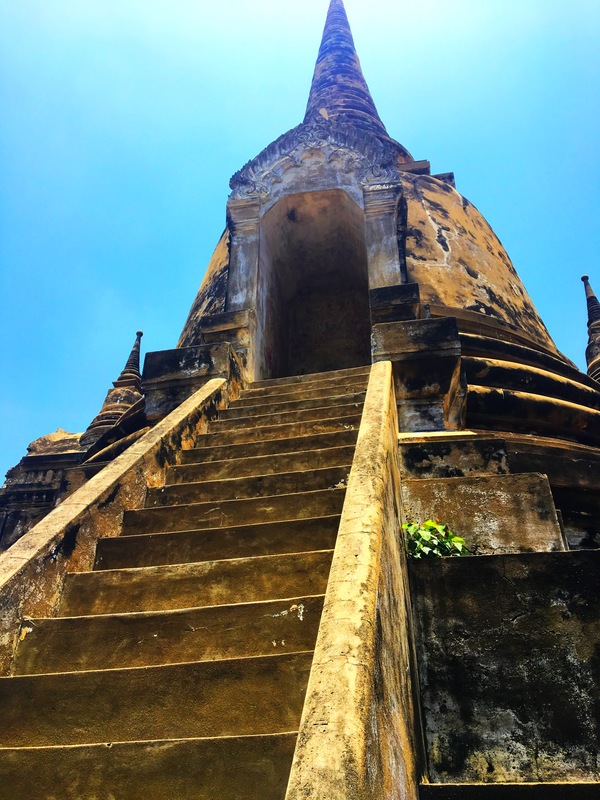 UP NEXT: We’re leaving Bangkok behind for Ko Samui. I’m excited to see another part of this lovely country. Another day in Bangkok! There wasn’t much sleep that happened last night due to jetlag, but we set out determined to make the most of the day! Today we went the American route and enjoyed a delicious breakfast at Dean & Deluca. It was light and lovely inside, and the food was amazing. I had to refrain from going grocery shopping there though, I didn’t love the idea of getting Scottish shortbread that I usually bring home from Great Britain on this trip to Asia. 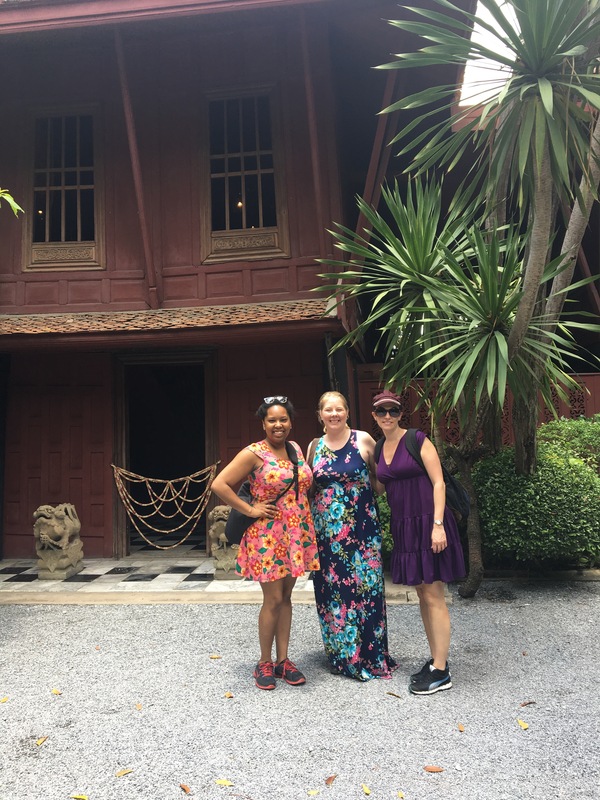 After breakfast we headed across town on the BTS to the Jim Thompson house. 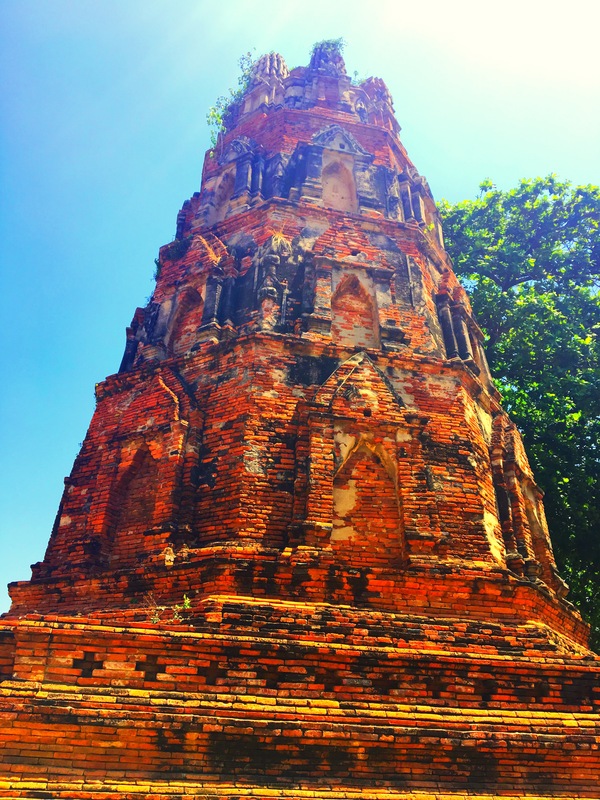 Thompson was an American who fell in love with Thailand after WWII and decided to stay here. He helped to bring the amazing silk trade to the company and is very mysterious because he suddenly disappeared at age 61 and no one knows where he went! The house was lovely, and we got to see some traditional Thai housing. Soon enough we arrived safely at Pratunam Market. I think perhaps we went on the wrong day or at the wrong time because there was not much on offer at the market and we left pretty much as soon as we got there. Instead, we decided to go across the street to the Platinum Mall, mostly because it was indoors and air conditioned. I’m not sure what we were expecting, but what we found inside with consistent with the rest of Bangkok – well-controlled chaos. Picture six floors of a mall with two banks of escalators and literally hundreds of little stalls more in the way of a market than a mall that we’re used to in the States. 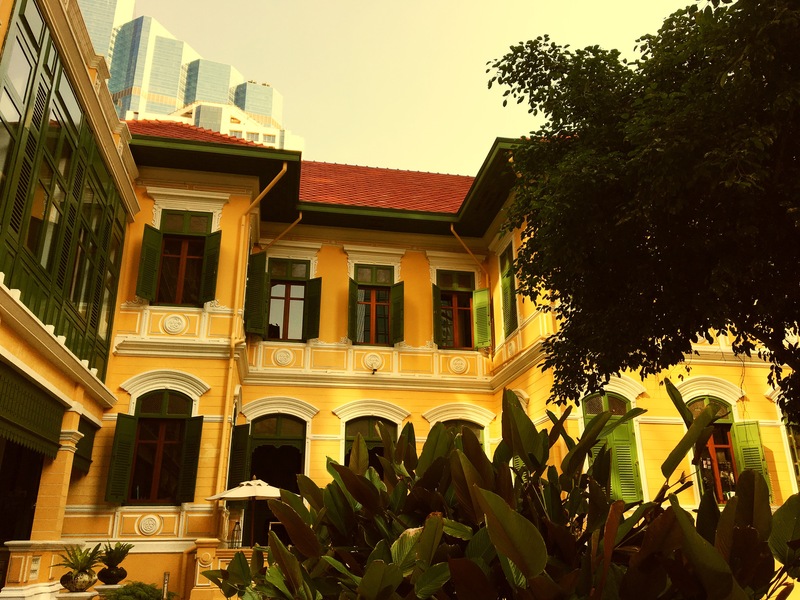 We were able to find a couple of once items before we were heading to House on Sathorn to try Thai afternoon tea. We were seated in the courtyard, in the shade, and next to the fan. They were able to serve our tea iced and it was so delicious and refreshing. After tea we headed back to the hotel to relax for a few hours. For dinner we went to this little tavern called Lady Brett. It was small but enjoyable and I had the most juicy and delicious chicken thigh with grilled sticky rice which mean that it was brown. At first I thought that it was burnt, but when I tasted it. Yummy, yummy, yummy! 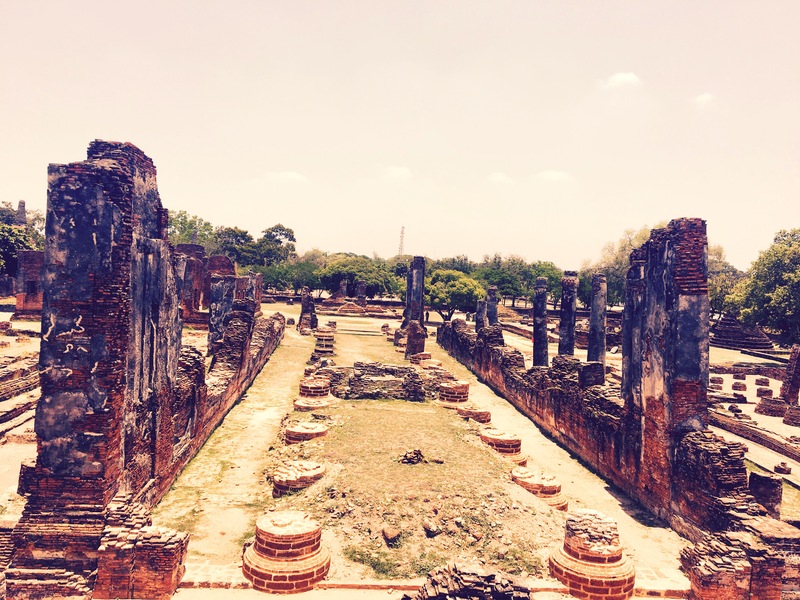 UP NEXT: We’re leaving Bangkok to the day to go explore ancient ruins!